The Mad Mammy: Who Needs To Be Nice! Who Needs To Be Nice! December and all its threats of, "you'd better be good or you won't get anything from Santa!" seems very far away now in the run up to Valentine's Day but for me it is a month when I am glad to have that little something extra in my arsenal when it comes to managing the Dude. I don't know what it is about December but the Dude's behaviour always takes a dive towards the mid-way mark which traditionally sees him firmly placed on the naughty list. The second half of the month is usually a focused effort on behalf of myself and Big Daddy to get him on the nice list with lots of cajoling, gentle reminders, pointed discussions and outright threats. So far we have been successful and every Christmas morning the Dude has awoken to gifts under the tree for him instead of a lump of coal. However, I have often wondered to what extent we are successfully managing his behaviour or to what extent is he just playing along - letting us think we are in control! It was something of a dodgy weather day so I decided to head to the hairdressers at the local shopping centre and Big Daddy took the kids for a much requested play at the indoor play place. Two hours later I emerged from the salon, thankfully looking more Glammy Mammy and less Granny Mammy! The kids announced they were hungry so we went in search of food (a tad more challenging now since we have a vegetarian in the family). The Dude informed Big Daddy he was starving and he couldn't possibly spare a piece of the garlic bread. "What?" he asked, "are you refusing to share your garlic bread with me?" The Dude fixed him with a, "don't even think about it," glare and said, "yes, I'm hungry." Still in shock, Big Daddy pressed for confirmation. 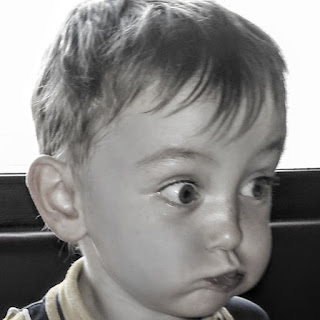 "So let me get this straight, I've just spent thirty dollars on taking you to a play place and drinks and another twenty dollars on garlic bread and you can't share some of it with me?" The Dude looked at him. "You can go and get your own garlic bread," he pointed out, "I'm eating all of this because I'm hungry." Big Daddy pointed out that he never finished anything and if he finished the garlic bread it would be the first time in his life he finished a portion of food we bought for him. The Dude fixed him with a belligerent look and announced, "well I'm eating all of this." Go To Hell Daddy - This Bread Is Mine! Big Daddy fixed him with an, "ok kid you're on," look and informed him that he'd better finish it or he wasn't getting any ice cream. He pointed out that the Dude could give him a piece of garlic bread now, when it was hot because he wasn't interested in eating a cold piece when the Dude couldn't eat any more and decided to offer what was left to him, just so he could get an ice cream. The Dude looked Big Daddy in the eye, no overt defiance, nothing, just a quiet declaration, "I'm eating it all." Big Daddy sat back, sure in the knowledge that in ten minutes we would be dragging a disgruntled seven year old to the car without an ice cream and he would have won this face-off with his son. An hour later myself and Big Daddy exchanged glances as the Dude sat there quietly getting through the garlic bread. Big Daddy had settled in with some beers. I sipped my water. La-la wondered when we could get ice cream. The Dude looked like he was fit to burst but still he kept putting bite-sized pieces of garlic bread into his mouth. His face was a mask of innocence but I could almost hear the cogs of his mind working overtime. This was a big "screw you" to his parents! 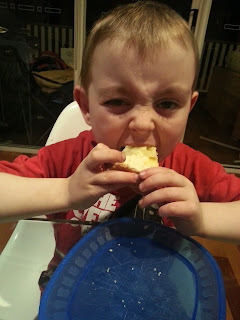 A half an hour later he was reduced to tearing the garlic bread into tiny pieces and then popping them into his mouth. I've never seen him eat so much food in one sitting before and I knew he was struggling but it was obvious he had no intention of stopping until there wasn't a crumb left. I glanced at Big Daddy who gave me a, "what the hell" look. I tried to hold back the laughter. The Dude sat there, still with the look of innocence on his face, no defiance, no hint of what he was really up to, except for he was starting to look a little uncomfortable. I decided to give him an out. "You know, I'm sure if you apologise to Daddy for being so selfish and explain to him that you won't do it again, he might consider buying you a small ice cream." The Dude looked at me, curiously, and then proceeded to keep breaking the garlic bread into tiny pieces and forcing them into his mouth. Fifteen minutes later there wasn't a crumb left. He turned to his Dad and announced, "I'm sorry Daddy but as you can clearly see, I really was very hungry." Big Daddy was somewhat at a loss. It was obvious we were being played. Before Big Daddy could say anything, I jumped in. "Hang on," I said, "are you apologising because you are really sorry or because you just want an ice cream." He looked at me, a little squeeze of his eyes telling me he resented me calling him out on what he considered the perfect play of his parents. He hesitated, wondering what was the best way to answer my question. My gaze was unflinching and direct, warning him in no uncertain terms to tell the truth. "Well, I wanted to say sorry but I was angry so I didn't but now I've thought about it and I am really sorry and I won't be so selfish again." He flicked a look over at his Dad. "Am I allowed an ice cream?" the Dude asked. Big Daddy looked at me, with a, "what you wanna do" look on his face. I asked the Dude if he could possibly fit an ice cream in after all that garlic bread? I waited, letting him stew and then handed down my decision. "You can get a small ice cream today, you were obviously very hungry (the last comment was to give him the impression we hadn't seen through his actions, I think it's very important for the future that he thinks we're a pair of eejits who he can pull one over on, otherwise he might up his game and then we're totally screwed!) and you told the truth about being angry and I believe your apology to Daddy was genuine. However, you need to lose the selfish 'tude. If there's any more of it going forward then you are going to be a very sorry little boy." He nodded his head very solemnly but..... I can't be sure, but there may have been a hint of a grin lurking at the edge of his lips.